First of all, my dear ol’ mum bought me a lovely Thornton’s dark chocolate Easter Egg. How much of a big kid can you get? To reciprocate, we thought we’d drag her off to a magnificent bluebell wood so she could mutter things like “ooh” and “ahh”. Spring has been such that everything is happening earlier than normal this year. 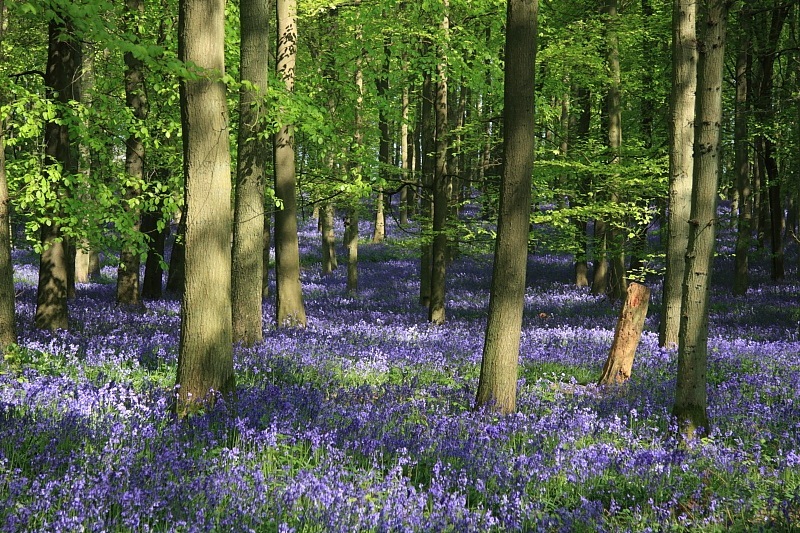 Bluebells burst out about two weeks ahead of their usual schedule and the wood up near Ashridge is one of the more spectacular displays available and attracts hoards from miles around. You have to be patient and/or work hard to get shots sans bright red shirts and tripods spoiling the view but it can be done – just. The scent was fabulous, too, but I can’t embed that with this technology. The critters that we love are also generally ahead of schedule and are wasting no time doing what comes naturally, making babies while the sun shines. We began on Easter Sunday by visiting the Chiltern Hills on another flower hunt, this time in search of early orchids. It was really Carol in search of orchids ‘cos I’m really only fascinated by things with a heartbeat – well, a pulsating abdomen, more accurately – but it was a great excuse for a trip out with the roof down in this utterly unbelievable run of spring weather. We thought that the orchids might also have been substantially advanced but not advanced enough, it seems. Carol spotted a few telltale spotted leaves of early purple orchids but no actual flower spikes. I’d lagged behind photographing a Holly Blue (Celastrina argiolus) in the act, I think, of ovipositing several future Holy Blues and, as I caught up with her (Carol, that is, not the female Holly Blue), she asked, “do you know a butterfly which is bright green and navy blue?”. 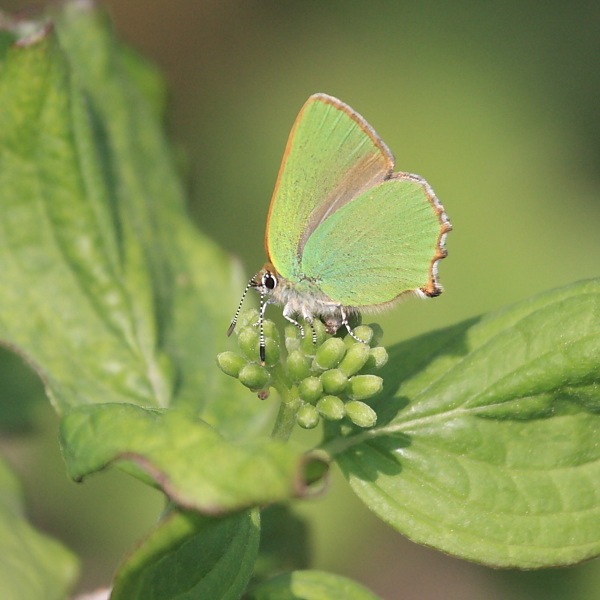 Thinks: the only green I can think of is the Green Hairstreak but I don’t think it has any blue on it. “No, not really. 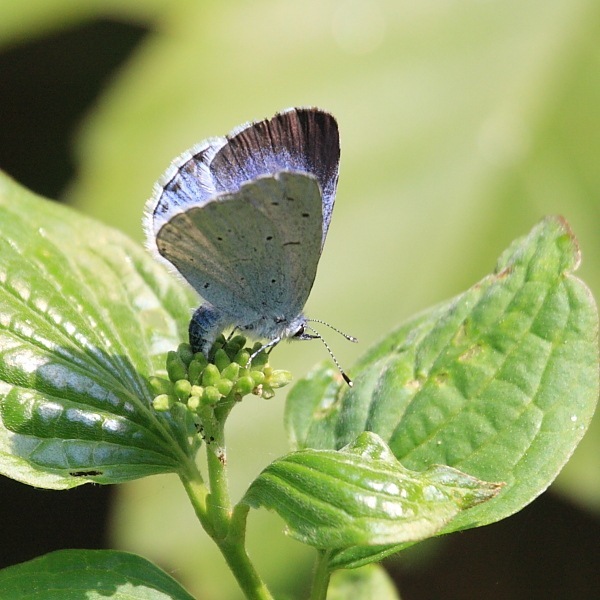 Green Hairstreaks are green but …”. Carol had scared up an elusive green beast which had fluttered off into the undergrowth. Naturally, it’s very difficult to spot a green beast in green undergrowth but, well, I’m getting used to hawk-eyes Carol seeing such things. Sure enough, she found it again. 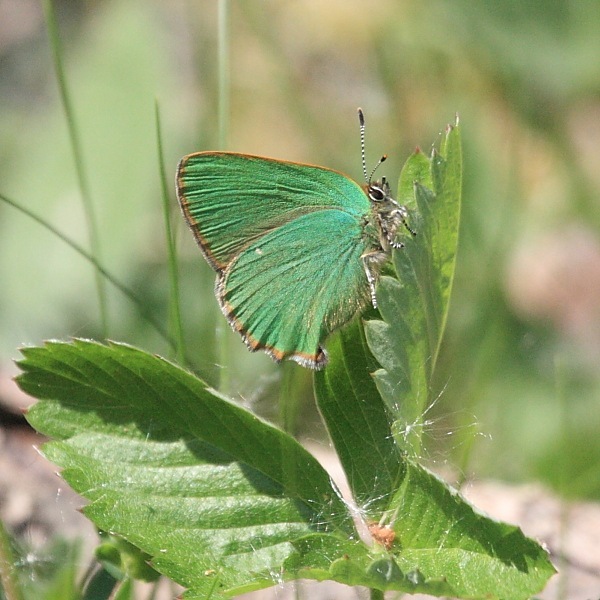 The beast in question was, indeed, a Green Hairstreak (Callophrys rubi). I think you’ll see the magnitude of the challenge from this picture. I have been fascinated with butterflies for 50 years, since Brooke Bond issued a collection of butterfly cards in their PG Tips tea packets. I’d drink tea just to make mother buy another packet so I could collect more cards. In 50 years of interest, however, I’d never before seen a Hairstreak of any description, green or otherwise. With camouflage this good, is it any wonder I hadn’t spotted one? This was a very special day for me. It certainly made up for the lack of orchids. 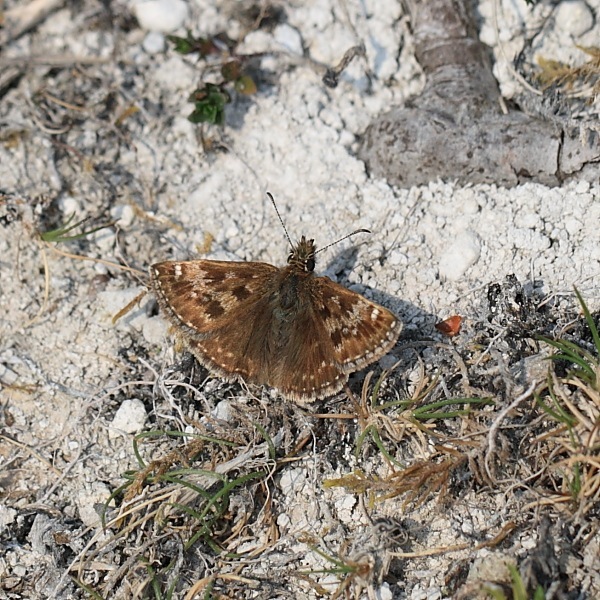 On our way back to the car, carol snagged this shot of the rather unkindly named Dingy Skipper (Erynnis targes). Two had been spiralling about in a territorial tussle and Carol picked the one that was in better condition. I, on the other hand … well, enough said. 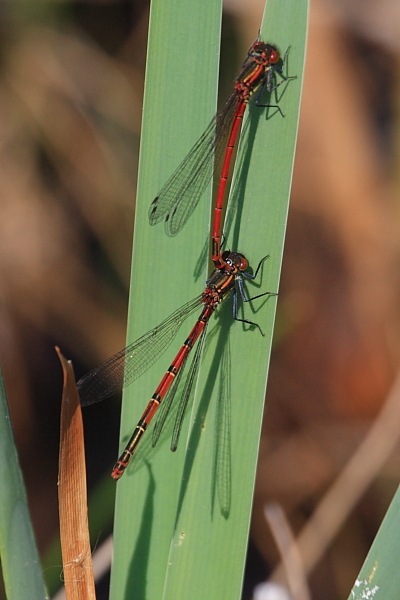 Finally we did make it to the dragonfly hangouts where the world was also suddenly full of copulating Large Red Damselflies (Pyrrhosoma nymphula). We saw them at a couple of locations in Sandhouse Lane but this tandem pair is, I think, the best and most interesting shot of the bunch – and I do mean bunch – because it helps distinguish the markings of the male (in front) versus female (at the back). We spotted a lone example of a second species, too, a Blue-tailed Damselfly (Ishnura elegans), though it wasn’t co-operative enough to pose well. Maybe next time. The season is hotting up. Love that wood – very 3D & HD photograph. V envious of the Hairstreak.